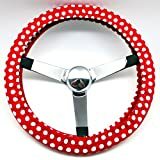 Hand made steering wheel covers, perfect for the summer and winter seasons. Made with licensed cotton fabric and lined with grip stop fabric. Hand washable. Covers will fit 14″-15 inch steering wheel. Steering Wheel not included. Smaller or larger covers available upon request. Any wheel larger than 15″ will require a larger size. Please send a message if yours is larger than 15″. Pattern placement will vary. Please check out my store for other pattern styles.